If you’re really honest with yourself, you don’t want to be more responsible for your life. Said differently, you don’t want to be take on more ownership for how things are going. Taking ownership and being responsible is burdensome. It means there’s more that you have to lift. Like going to the gym, every day and pushing more weight, it’s tiresome. It’s annoying. It’s a burden that you have to confront and take on, even and especially in those moments when all you really want to do is stay in your warm, cozy bed. The human condition is to veer away from responsibility, because responsibility paints a target on your back. It means you’re the last point of call for something being handled. It means more work. It means you being in more difficult conversations, and it means less avenues to escape to safety. If not for the results it provided, few people would go to the gym (while you may like the feel of lifting weights, if your body saw no change as a result, you probably would feel less inclined to keep doing it, right?). The side-benefit of going to the gym is that we look fit and healthy, but the real benefit, the benefit that helps you in your life, is that you can do more with your body. You are capable of lifting more work. This is the same reason to take on more responsibility — it allows you to do more as leader. Being a leader means being responsible for more and more of the way things are going, moment by moment, day by day, in your life. 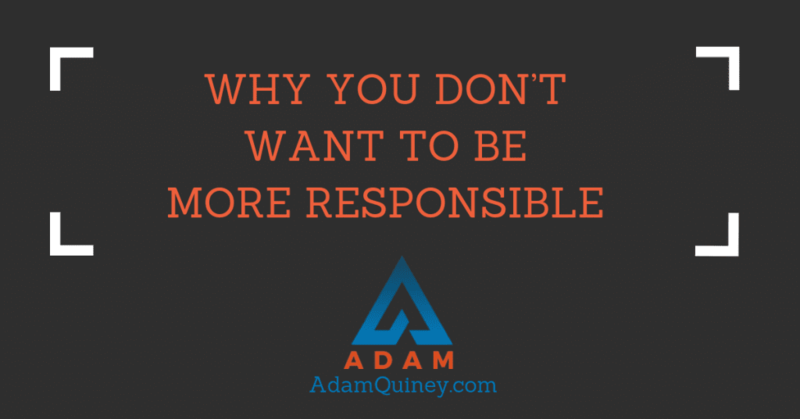 Taking on more responsibility isn’t necessarily fun. It’s burdensome, tiring and often directly in opposition to the warm coziness of the bed that victimhood represents. But taking it on allows you more power in your life. It allows you to do more, as leader. And the only way to grow those muscles are to push yourself beyond your current capacity.